The Holidays are FINALLY over! Hooray!!! Work has finally begun to slow down and I have had some time to go snowboarding and cook for myself again. I made it through with only having two sick days. *Knock on wood* My herb plants have gotten huge, leaving me with an abundance of sage, rosemary and thyme. I also planted the bottom stalks of my scallions and they grow like an inch a day! If you have never tried replanting your scallions or celery you must try it! Here is a good article about plants you can re-grow: 12 Vegetables That Magically Regrow Themselves. I have tried, and succeeded, in regrowing bok choy, celery, scallions and lettuce. I think I will try the pineapple and avocado for kicks! I am still in the rich winter comfort food zone, so I hope you are as well! I decided to try adding balsamic to my brown butter sauce on a whim and it was a great addition! This recipe has a rich nuttiness from the brown butter that is balanced out by the acidic balsamic vinegar. The sweet potatoes and kale are great, nutritious additions as well! If you haven't already, brown ¼ C of unsalted butter by heating over medium-high heat. Be sure to stir frequently. For the sauce, add sage, parsley, garlic and pepper to the brown butter and sauté on medium-low until fragrant. Add the balsamic vinegar and brown sugar. Turn the heat to medium-high and cook until vinegar has cooked down by half. Add the chicken stock and simmer until reduced by half. For the main dish, bring a large pot of water to a boil. Add the diced sweet potatoes and cook until soft. Once finished, add cream and butter and mash until smooth. Preheat oven to 375F. Season the pork chops with salt and pepper and sear in canola oil over high heat. Finish the chops in the oven until internal temperature of 145F is reached. Heat the olive oil in a sauté pan and add the onions. Once the onions are translucent, add the kale and sauté until wilted. 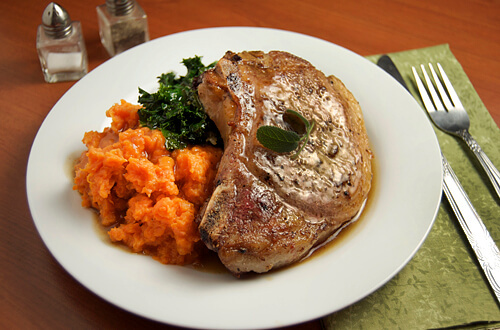 To serve, plate the potatoes, kale and pork chop and drizzle with sauce. OMG, I’d give anything if I could eat this off the screen RIGHT NOW! Love your tip about regrowing veggies. I’m going to try growing some scallions and celery, too! I’m thinking a couple of long “window planters” would make for a nice indoor veggie garden! Thanks for the tip. Nice! I started my scallions off in water and transplanted them once they grew a bit. I saved a pineapple top from work yesterday so we’ll see how that turns out! A cool plant if anything! Thanks for the tip to start the scallions in water. That makes sense to give them a good strong root structure before planting them. Fun idea on the pineapple too! I’ve done the same with avocados, which make a pretty cool plant, though I’ve never grown one to the point of actually producing any avocados. But they are a very tall and leggy plant; do you know if pineapple plants are lower and fuller? The pineapple plant looks just like the top but grows into a large bush. Some can get 6ft wide if they are outdoors!